John M. Quesenberry, Lieutenant, born Nov. 5, 1918, Hansford, Kanawha County, WV. Graduated Charleston HS on May 29, 1936, and enlisted in the USN on Sept. 14, 1937, at Richmond, VA. Recruit training and Class "A" Radio School were at NOB Norfolk, VA. Served in Chaumont (AP-5); West Virginia (BB-48); DESBASE San Diego, CA; DD RECOMM Detail; DESRON 36 Flag Allowance; Crane (DD-109); Shubrick (DD-268); Borie (DD-215); Flag Allowance SQ 40-T; Omaha (CL-4); COMBATDIV 5 Flag Allowance; New York (B-34); Arkansas (BB-33); Texas (BB-35); Navy Dept. (Radio Central Room 2629) Washington, DC; Swedish M/S Lima; Staff Naval Attache American Embassy, Chunking, China; Naval Observer China; NAVRADSTA Imperial Beach, CA; NAVRADSTA Wahiawa, Oahu, HI; NAVRADSTA Bainbridge Island, WA: NTC San Diego, CA; HQ NSG Washington, DC; Navy Language School Ana Costia, DC; NAVCOMMSTA Kami Seya Japan; NSA Fort Meade, MD; NAVCOMMSTA San Miguel, Philippines; NSA Fort Meade, MD; NTC Bainbridge, MD; NSA Fort Meade, MD. 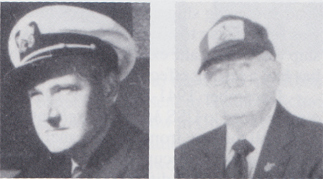 Statutorily retired as lieutenant (LDO YG57) Nov. 1, 1967, after over 30 years active naval service. Hired by National Security Agency on May 8, 1968, as instructor in cryptology. Retired from NSA in January 1981 on disability with 43 years of government service, 40 of which were in cryptology. Married Navy nurse, Jeanette Beauford, of Skowhegan, ME, on Oct. 21, 1941 (deceased April 30, 1973). Has two children. Remarried Biddie Helsel Six of Princeton, WV, on May 10, 1987. Appointed on May 25, 1989, by Gov. Gaston Caperton of West Virginia to the West Virginia State Committee to support the launching and commissioning of the new ballistic missile submarine USS West Virginia (SSBN-736) and so served until the committee was dissolved on Nov. 27, 1990. His amateur radio license KB4BKS.